Some bird lovers hang feeders in their gardens and accumulate garden lists, others participate in annual 'Christmas Counts', a select few travel to the ends of the earth in an effort to see every bird in the world. 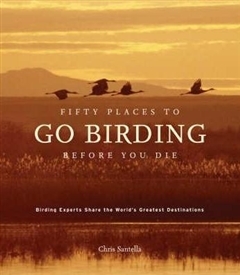 With "Fifty Places to Go Birding Before You Die", Chris Santella takes the best-selling Fifty places recipe and applies it to this most popular pastime.Santella presents some of the greatest bird-watching venues in the World through interviews with prominent birders, from tour leaders and conservationists to ornithologists and academics. 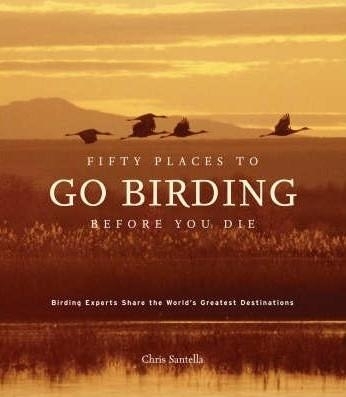 The interviewees include ornithologist Kenn Kaufman; David Allen Sibley, author and illustrator of "The Sibley Guide to Birds"; Rose Ann Rowlett, the 'mother of modern birding'; John Fitzpatrick, director of the Cornell Lab of Ornithology and Steve McCormick, president and CEO of The Nature Conservancy.The places vary from the urban (New York City's Central Park) to the mystical (the cloud forests of Triunfo in Chiapas, Mexico) to the extremely remote (the sub-Arctic islands of New Zealand). The book includes more than 40 photographs that capture the vibrancy of our feathered friends, and the beautiful places they call home.